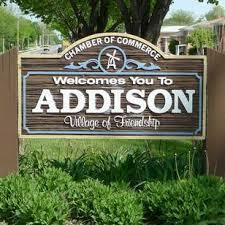 Located Just 8 miles west of West bend, Addison is a quiet, rural community that is conveniently located near U.S. Highway 41 for easy, fast commutes to the larger surrounding communities. Beautiful trees and rolling farm fields make the community a quiet, pastoral and serene place to find your NextHome! But there is plenty of fun to be had by all in the community. The Allenton Youth Organization has a softball league that the children of Addison can participate in. And there is an adult kickball league that is fun for adults. In addition, there are several community orientated organizations that actively support and promote Addison and greater Allenton Area. The Allenton Area Advancement Association holds an annual Steak Fry that brings citizens and area visitors together for good eats and family fun. The Farmer’s Market is open seasonally on Tuesday evenings at the corner of Main and Weis Streets. And The Allenton Lion’s Club holds a 4th of July Weekend annual Car Show and Flea Market, which also draws visitors from miles around. If your are looking for your NextHome, consider Addison! Give us a call today to find out more about the available properties in the area!